One of the highlights of the weekend was the fact that Justin got to come to the wedding. We found out that he could come on Wed. and he was in Sioux Falls on Friday. Sioux Falls airport is just the right size - small. We occupied most of the waiting room. It was so cool. This is the sign that we made for Justin. He had called earlier that night from Chicago and he had told Roger W. - "I don't want any signs." Roger knew exactly what to do. 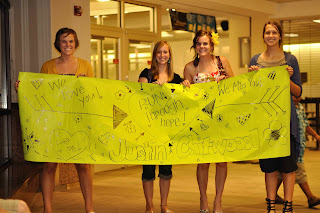 So Justin had a sign. So glad he could make it.